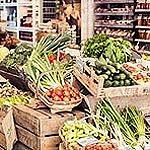 Daylesford Organic farmshop and cafe offers seasonal and fresh produce including artisan cheeses, breads and organic meats. Do you work at Daylesford Organic? 6 destinations curated by View .